Tonight’s discussion is on The Sandman (1989) issues #2-4, which follow Dream as he returns to his kingdom of dreams and sets out on a quest to rediscover two of his three crucial tools – his pouch of sand and his helm. What people often forget in talking about Sandman as a modern masterpiece is that it started out as very much a horror comic. It was also not so specifically disconnected from the DC Universe – we peek into Arkham in issue #2, hang out with Constantine in #3, and meet Etrigan in #4. 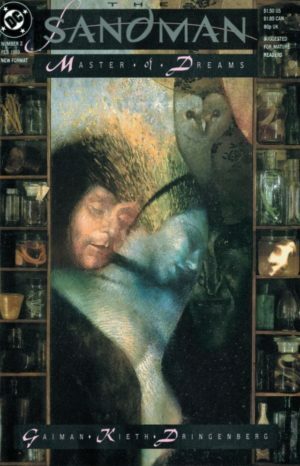 The Sandman (1989) #2 is Gaiman building a world, and dispensing a lot of information along the way, though some of it we will not recognize until much later. Sandman discovers his Cain and Abel, his librarian, and his decrepit castle – all of his dream time falling apart without him to hold it together. Dream resolves to regain his three aspects and consults the trio of fates for them in a memorable sequence packed with literary references. His pouch of sand currently resides with Constantine, which he views as easier to acquire than his jewel (with the League) or his helmet (with a demon). Kieth’s art is a bit lumpy here, though the later recolor does it many favors. It’s our first time seeing Morpheus unbound, and he bears an uncanny resemblance to his creator. The Sandman (1989) #3 is a low point of early Sandman for me – bringing in the caustic John Constantine and showing us Dream through his eyes. It feels much more like a Hellblazer issue than a Sandman issue. Also, Kieth and Dringenberg’s art here goes a bit sour, just too inconsistent and droopy across a tale told primarily with a specific, human character (though there are some great panels, like the reveal of Constantine’s former lover). I think it is in The Sandman (1989) #4 that Sandman became a classic. This issue is firmly rooted in Christian mythology, but also features an active, clever Dream increasing in his powers. It’s also quite boldly drawn by Kieth and Dridenberg, with the notable trio of demons – Beezlebub, a human with a fly’s head, Azazeal, a sort of Beholder, and Lucifer Morningstar, who is apparently a Space Oddity eta David Bowie. Dream’s journey to the underworld is dire with a dash of humor beneath as Etrigan takes him through the suicide grove and past his own lost love, and later as Sandman engages in the most famous sort of wizard’s duel, that we all know from Sword In the Stone. Crushing Comics S01E24 – Atari, Wonder Woman newspaper strips, Gaiman’s Death & Sandman Overture, & more!